Maeve O’Meara teams up with two talented Brazilian cooks—Regina Kytzia from Casa Brazil Restaurant and Edna Barzel of Sweet Brazil—both of whom are passionate about their homeland and keen to show off the many ingredients used. Regina takes us to shop for fresh produce in a Vietnamese emporium, while Edna visits a Portuguese deli. Across town, another Brazilian cook, Patricia Nunes, introduces Maeve to the delights of Brazil's favorite cocktail the caipirinha, made with lots of lime and a spirit from sugarcane that’s 40% proof. Patricia says it’s the only way to cook and then whips up the drop dead fabulous Brazilian seafood stew called moqueca with its fresh flavors of lime and coriander. We visit a Portuguese butcher to stock up on pork, chouriço and carne seca (salted air dried beef) ready to make the national dish called feijoada. Edna Barzel says this hearty dish is enjoyed at least once a week, and it’s the one thing that can make a Brazilian incredibly homesick. We learn about the lovely little cheese bread made with cassava flour that Brazilians love to snack on called Pão de Queijo, discover what makes a churrasco barbecue so delicious, and taste Regina's easy chicken and prawn dish from her home near Sao Paolo. Dora Silva then whips up sweet coconut custard for dessert. Brazil is the largest country in South America. It is the world's fifth largest country, both by geographical area and by population with over 190 million people. It is the only Portuguese-speaking country in the Americas. Brazil was a colony of Portugal from the landing of Pedro Álvares Cabral in 1500 until 1815, when it was elevated to United Kingdom with Portugal and Algarves. The colonial bond was in fact broken in 1808, when the capital of the Portuguese Kingdom was transferred from Lisbon to Rio de Janeiro, after Napoleon invaded Portugal. The independence from Portugal was achieved in 1822. Initially independent as the Empire of Brazil, the country has been a republic since 1889. Brazil is a founding member of the United Nations. The Brazilian economy is the world's seventh largest economy by nominal GDP and the eighth largest by purchasing power parity. Brazil is one of the world's fastest growing major economies. Economic reforms have given the country new international recognition. Brazilian exports are booming, creating a new generation of tycoons. Major export products include aircraft, electrical equipment, automobiles, ethanol, textiles, footwear, iron ore, steel, coffee, orange juice, soybeans and corned beef. The country has been expanding its presence in international financial and commodities markets. Brazil is also home to a diversity of wildlife, natural environments, and extensive natural resources in a variety of protected habitats. Brazil is the most diverse country in South America and arguably the world. According to the National Research by Household Sample of 2008, 48.43% of the population (about 92 million) described themselves as White; 43.80% (about 83 million) as Brown (Multiracial); 6.84% (about 13 million) as Black; 0.58% (about 1.1 million) as Asian; and 0.28% (about 536 thousand) as Amerindian, while 0.07% (about 130 thousand) did not declare their race. Most Brazilians descend from the country's indigenous peoples, Portuguese settlers, and African slaves. Since the arrival of the Portuguese in 1500, considerable intermarriage between these three groups has taken place. The brown population (as multiracial Brazilians are officially called; pardo in Portuguese) is a broad category that includes Caboclos (descendants of Whites and Indians), Mulattoes (descendants of Whites and Blacks) and Cafuzos (descendants of Blacks and Indians). Some aspects of Brazilian culture were influenced by the contributions of Italian, German and other European immigrants who arrived in large numbers in the South and Southeast of Brazil. The indigenous Amerindians influenced Brazil's language and cuisine; and the Africans influenced language, cuisine, music, dance and religion. The most popular sport in Brazil is football (soccer). The Brazilian national football team is ranked among the best in the world according to the FIFA World Rankings, and has won the World Cup tournament a record five times. Basketball, volleyball, auto racing, and martial arts also attract large audiences. Tourism in Brazil is a growing sector and key to the economy of several regions of the country. The country had 4.8 million visitors in 2009, the main destination in South America, and second in Latin America after Mexico, in terms of the international tourist arrivals. Among the most popular destinations are the Amazon Rainforest, beaches and dunes in the Northeast Region, the Pantanal in the Center-West Region, beaches at Rio de Janeiro and Santa Catarina, cultural and historic tourism in Minas Gerais and business trips to São Paulo city. Brazilian cuisine is an exuberant, colorful mix of Portuguese, African and native foods including some from the Amazon. Brazilian food, like Brazil itself, varies greatly by region. Root vegetables such as cassava, yams, and peanuts, and fruits like açaí, cupuaçu, mango, papaya, guava, orange, passionfruit, pineapple, and hog plum are among the local ingredients used in cooking. Brazilian pine nuts are a popular national snack, as well as a lucrative export. Rice and beans are an extremely common dish, as are fish, beef and pork. 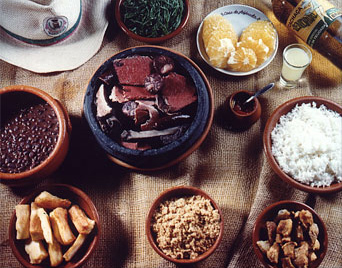 Some typical dishes are caruru, which consists of okra, onion, dried shrimp and toasted nuts (peanuts and/or cashews) cooked with palm oil until a spread-like consistency is reached; feijoada, a simmered bean-and-meat dish; tutu de feijão, a paste of beans and cassava flour; moqueca capixaba, consisting of slow-cooked fish, tomato, onion and garlic topped with cilantro; and chouriço, a mildly spicy sausage. Rice and beans is an extremely popular dish, considered basic at table; a tradition Brazil shares with several Caribbean nations. Salgadinhos are small savory snacks (literally salty snacks). Similar to Spanish tapas, these are mostly sold in corner shops and a staple at working class and lower middle-class familiar celebrations. Brazil is also known for cachaça, a popular native liquor used in the caipirinha. The European immigrants (primarily from Germany, Italy, Poland and Portugal) introduced wine, leaf vegetables, and dairy products into Brazilian cuisine. When potatoes were not available, they discovered how to use the native sweet manioc (cassava) as a replacement. Lasagna and other pasta dishes are also very popular. The Southeastern region, consisting mainly of the states of Minas Gerais, Rio de Janeiro, and São Paulo, is the industrial heart of Brazil, and is home to several distinctive cooking styles for which Brazil is probably best-known. In Minas Gerais the regional dishes include corn, pork, beans, chicken (including the very typical dish frango com quiabo, or "chicken with okra") and local soft ripened traditional cheeses. Farofa (a dish of toasted manioc flour with small amounts of flavoring ingredients such as pork, onions, hard boiled eggs or different vegetables), polenta, couve (collard greens), chouriço (a type of sausage that is less spicy than its cousin chorizo), tutu à mineira (a paste of beans and manioc flour) and fried bananas are examples of popular dishes from Minas Gerais. The dairy-producing state of Minas Gerais is known for such cheeses as queijo Minas, a soft, mild-flavored fresh white cheese usually sold packaged in water; requeijão, a mildly salty, silky-textured, spreadable cheese sold in glass jars and eaten on bread, and Catupiry, a soft processed cheese sold in a distinctive round wooden box. In Rio, São Paulo and Minas Gerais, feijoada (a black bean and meat stew rooted), is popular especially as a Wednesday or Saturday lunch. Also consumed frequently is feijão com arroz, or rice and beans. Another typical food in São Paulo is the Virado à Paulista, that consists of rice, tutu de feijão (a paste of beans and manioc flour; some times made of corn flour, in order to be drier than the manioc flour one), sautéed collard greens (couve) and pork chops, typically bisteca, the pork equivalent of the T-bone steak. It is usually accompanied by pork rinds, bits of sausage, a fried egg and a fried banana. The cuisine of São Paulo shows the influence of European and Middle Eastern immigrants. The majority of immigrants in São Paulo arrived from Italy, along with many from Portugal, Japan, Lebanon, Spain, Germany and other nations. Hence, it is possible to find a wide array of cuisines. In the city of São Paulo, pizza is a popular dish, and sushi has entered the mainstream and can be found in regular, non-Japanese restaurants. Many Brazilians eat pasta as well. Mortadella sandwich is any sandwich using mortadella, a large Italian sausage, and also refers to a very popular sandwich in Brazil especially Sao Paulo made with mortadella sausage. The sandwich is made from nearly a half of a pound of mortadella sausage, provolone cheese, sourdough bread, mayonnaise and dijon mustard. The cuisine of the Northern region, which includes the states of Acre, Amazonas, Amapá, Pará, Rondônia, Roraima, and Tocantins, is heavily influenced by indigenous cuisine. The Northeast part of Brazil, mainly the states of Alagoas, Bahia, Ceará, Maranhão, Paraíba, Pernambuco, Piauí, Rio Grande do Norte, and Sergipe, comprises geographically of a narrow, fertile coastal plain with abundant rainfall where much of the population is found, an equally narrow transition zone called the Agreste, and a large semi-arid region called the Sertão, which is dominated by large cattle ranches. All kinds of tropical produce are grown on the coastal plain, with sugarcane and cacao being particularly abundant. Within the State of Bahia the predominant cuisine is Afro-Bahian, which evolved from plantation cooks improvising on African, Amerindian, and traditional Portuguese dishes using locally available ingredients. Typical dishes include vatapá, moqueca (both having seafood and palm oil), and acarajé (a salted muffin made with white beans, onion and fried in palm oil (dendê) which is filled with dried shrimp, red pepper and caruru (mashed okra with ground cashew nut, smoked shrimp, onion, pepper and garlic). The main staple is a plate of white rice and black beans but other common foods include farofa, paçoca, canjica, pamonha and quibebe. In the remainder of the coastal plains there is less African influence on the food, but seafood, shellfish, coconut and tropical fruit are menu staples. Commonly eaten tropical fruits in the North-eastern region include mango, papaya, guava, orange, passionfruit, pineapple, sweetsop, "hog-plum," Soursop, and cashew (both the fruit and the nut).